Citation Information: J Clin Invest. 2005;115(2):418-427. https://doi.org/10.1172/JCI22648. CC(A/T)6GG–dependent (CArG-dependent) and serum response factor–dependent (SRF-dependent) mechanisms are required for gene expression in smooth muscle cells (SMCs). However, an unusual feature of many SMC-selective promoter CArG elements is that they contain a conserved single G or C substitution in their central A/T-rich region, which reduces binding affinity for ubiquitously expressed SRF. We hypothesized that this CArG degeneracy contributes to cell-specific expression of smooth muscle α-actin in vivo, since substitution of c-fos consensus CArGs for the degenerate CArGs resulted in relaxed specificity in cultured cells. Surprisingly, our present results show that these substitutions have no effect on smooth muscle–specific transgene expression during normal development and maturation in transgenic mice. However, these substitutions significantly attenuated injury-induced downregulation of the mutant transgene under conditions where SRF expression was increased but expression of myocardin, a smooth muscle–selective SRF coactivator, was decreased. Finally, chromatin immunoprecipitation analyses, together with cell culture studies, suggested that myocardin selectively enhanced SRF binding to degenerate versus consensus CArG elements. Our results indicate that reductions in myocardin expression and the degeneracy of CArG elements within smooth muscle promoters play a key role in phenotypic switching of smooth muscle cells in vivo, as well as in mediating responses of CArG-dependent smooth muscle genes and growth regulatory genes under conditions in which these 2 classes of genes are differentially expressed. Schematic diagram of wild-type and SRE-substituted mutant/LacZ promoter constructs used to generate transgenic mice. 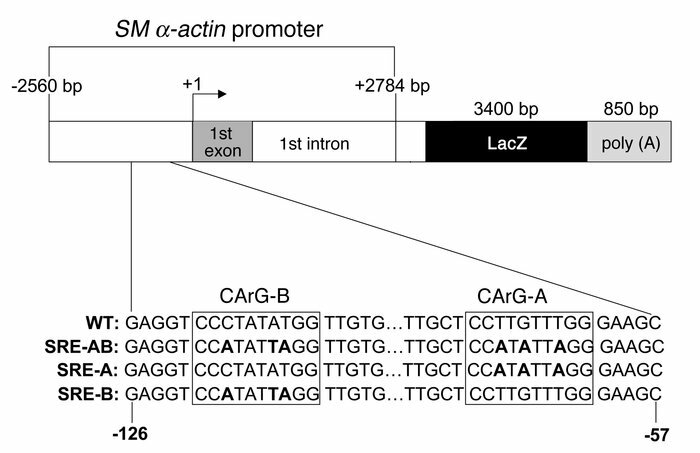 To determine the importance of the reduced SRF binding affinity of the degenerate CArGs for controlling SM α-actin expression, we generated mutant LacZ promoter constructs in which a c-fos SRE consensus CArG was substituted for the CArG-A and/or CArG-B element(s) within the SM α-actin promoter previously shown to mimic expression of the endogenous gene. The resulting mutations are shown in bold.